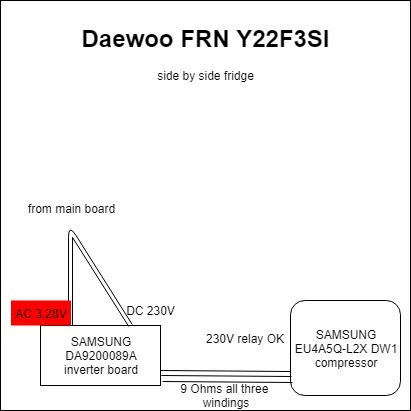 Daewoo FRN Y22F3SI - inverter board? Hi please check attached image. Do you think the problem could be with main board if inoput current into inverter board is so low? Does anybody has FRN Y22F3SI service manual please? Thank you. Manuals only availabile to paid professional technicians. Btw where is the diagram from? What I ask? OK. My refrigerator is not cooling. As I can say - inverter compressor doesn´t run. I measure its windings (as you can see in diagram). I checked the relay, I measure inverter board input voltage, I checked also inverter board (from main board) signal voltage. As I don´t have frequency meter I can´t check frequency on inverter board output nor inverter board input. The inverter board input voltage seems to be low in comparison to all other inverters you talk about on this formu (average about 5V). So I think this shloud be a problem. But I´m not sure because seems like this is the only refrigerator model in the world which doen´t has it s service manual online So I don´t know what is ussual voltage fot shis kind of inverter board. Also I don´t know how to turn fridge into diagnostic mode as I don´t have this manual. Main board doesn’t seem to be sending proper signal as you said. But it’s sending signal. I’d test temperature sensors as they may not be providing proper signal to the main board. But without manual that’s difficult. Usuall signals are DC and source Power AC but I have not experience with EU appliances. I think temp sensor swill be the same in US/EU. Is there some common way how to test/measure such temp sensor? Yet another question. There is only voltage or also frequency on input side of inverter board (I mean DC from main board)? If there should be only voltage I could try to "fake" voltage entering inverter board...let´s say 5V. In USA the inverter is powered by 120 VAC the signal is 5-12VDC.